Right past a bull moose. Brave or stupid? Do they eat people then? Obviously. Third or fourth fail post today. What has become of this site? I choose option C: Not stupid enough to believe the nonsense about how they attack everyone they see without provocation… Also, judging by the angle the guy is at relative to the brush, he probably hasn’t even seen the thing yet. Moose are big dumb and gentle, you could walk up to it, poke him in the nose and he probably would just look at you funny. @Tyger42 He did see it before he walked past it. There were three of us watching and taking pics of it. One guy was walking his dog and said that moose charged him the day before. 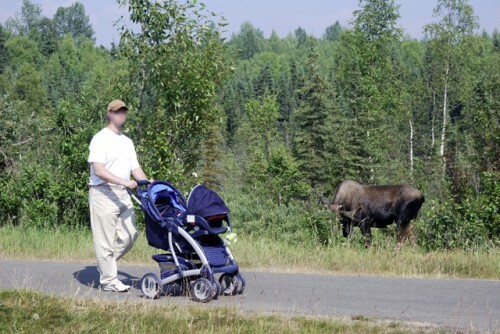 Moose are unpredictable. No more unpredictable than any other animal. And I’m sure the guy’s dog didn’t bark at the moose at all and spook it, huh? unless it’s rutting season and you pose some kind of threat to the bull they will leave you alone.